PSV strategy is a daily cycle of analyses and setups based on three main elements: pivot, sequence and volume and two elements supporting the decision-making process. A series of analyses created under the auspices of Trade.com broker. Analyses focus on the DAX index. Today, no great fireworks are expected. Today’s pivots are completely split in relation to yesterday’s heavy traffic, so today I will use directional points, narrowed down by statistically lower daily traffic after heavy traffic. Whether this is a good or wrong assumption will turn out to be, but the maximum deviations for today’s high/low session are at levels 11.420 as the maximum upper approach, and 11.240/30 as the lower one. Today we should oscillate around these levels. Today it is worth observing the area around the pivot – and the daily direction point for Wednesday’s session. It is these levels that should generate further signals. 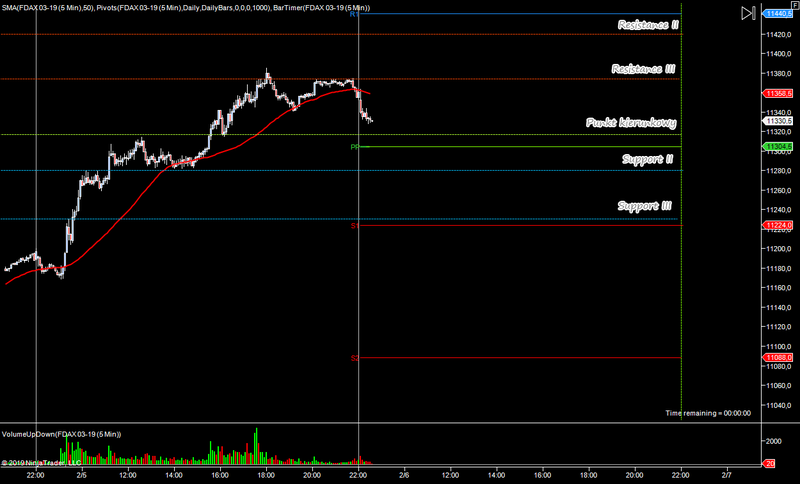 If it is exceeded / broken, then short positions will be legitimate with goals 11.280/70 and 11.240/30. If the level is defended, the 11.420/30 approach at 11.380/90 seems to be equally reasonable. Today, trade should be rather boring.